Pro Motion Menu Kit: 03 – Opening Night. We are just putting the finishing touches on the cover art and authoring templates, then we will record the tutorials and get this turkey launched within a few days. I thought all of you would like to see the entire menu, including the impressive backstage scene, so I’ve uploaded it with sample footage, text, & music dropped into the template so you can see what it looks like for an actual project. 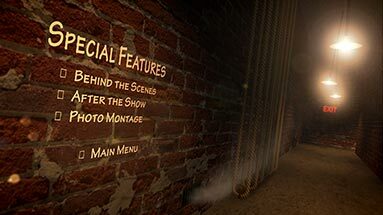 As we approach the release of our upcoming Pro Motion Menu Kit: 03 – Opening Night, we thought a particular texture would be perfect for some of the walls backstage. So we are on the hunt around town looking for just the right one. It has caused slight delays in the release date, however I feel it will be well worth the small wait. We’ve received several emails from customers reporting extremely long After Effects render times for our Pro Motion Menu Kit products. I’ve updated the Product Support Page to address some of these issues. It features an animated curtain which flows and loops seamlessly (generated entirely in after effects), a theatrically lit environment, dust particles illuminated by the lights, and of course easy and complete control over all the colors! This menu will be perfect for any kind of theater performances or films. We are hoping to have it released by the end of next week. Stay tuned! Pro Motion Menu Kit: 03.